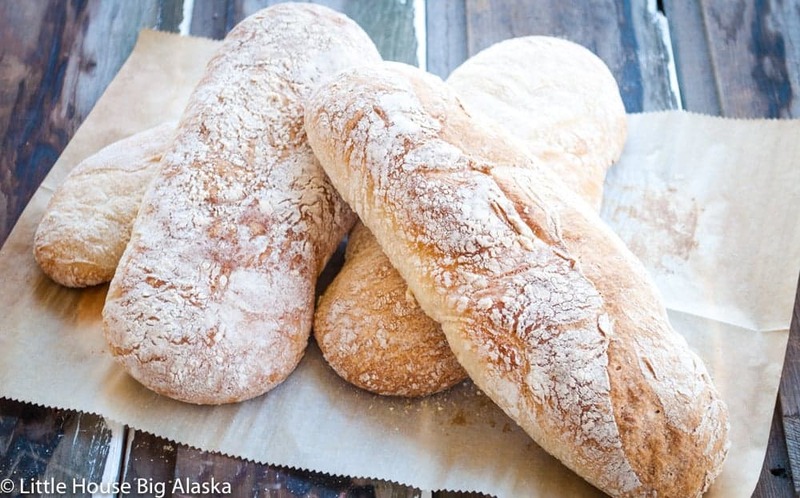 Try this Ciabatta bread recipe! It’s so easy, and hands off you’ll be making rustic bakery-style bread at home in no time flat. Even if you’ve never baked bread before. 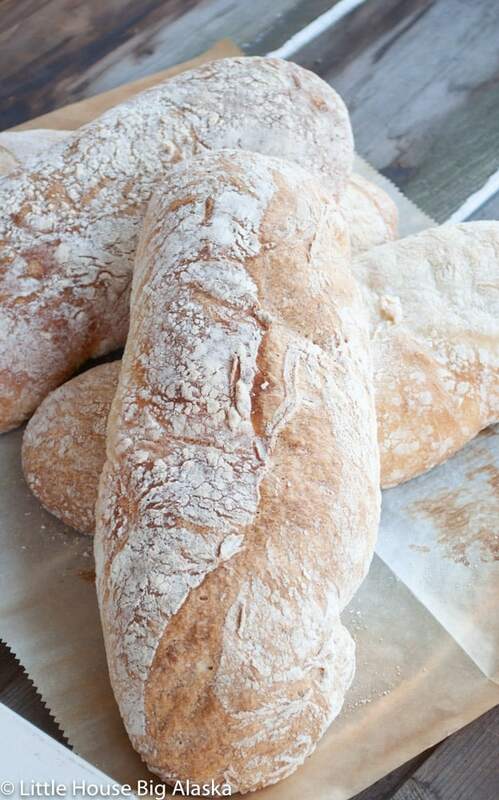 This easy to follow bread recipe will give you 4 nice size loaves of chewy ciabatta. It’s true this is an EASY recipe for bakery style bread, but you’ve got to follow the directions. I’ve baked it a couple of times now and when I do I follow the exact directions as given by Mr. Paul Hollywood himself. The very hardest part of the entire process is moving the bread from the counter to the baking sheets. 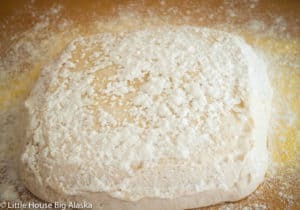 It wants to stretch out and get all weird so, flour the top well, cut decisively, turn it a 1/4 turn to get the cutting line down the top, gather it firmly in hand, move to the baking sheet, and lay it down. I can’t recommend a kitchen scale enough for making ANY bread at home, it gives you absolute control over the amount of ingredients. This recipe calls for 500 grams of bread flour. 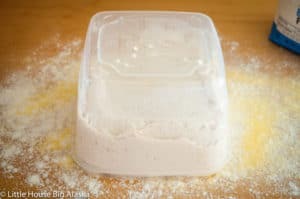 It’s hard to measure by scooping cups out but if you’re going that route be sure to run the flour through a sifter first to get accurate measurements. Watch the Masterclass with Paul and Mary on Netflix for a solid walkthrough of a Ciabatta Bread Recipe. And then watch collection one of the GBBO, bread week for the technical challenge of making ciabatta. Lot’s of good information tucked in those episodes and of course, they’re always fun to watch no matter what. One thing that’s interesting about Paul and his bread making is that he calls for tepid water, not warm. He says it allows the bread to develop more flavor. I’ve tried that will every trial of this recipe and I have to say it IS tasty bread. My kids will back me up on that too because they’ve inhaled all the ciabatta I’ve made this week perfecting the technique. No, it’s not perfect yet, but it’s getting closer. This is my first time making this type of bread. Patience is required. So tasy that I ate most of it by myself…taste tested some ciabatta buns from health food store ..it does not compare to homemade in the least I will ALWAYS will make my own ciabatta from now on !